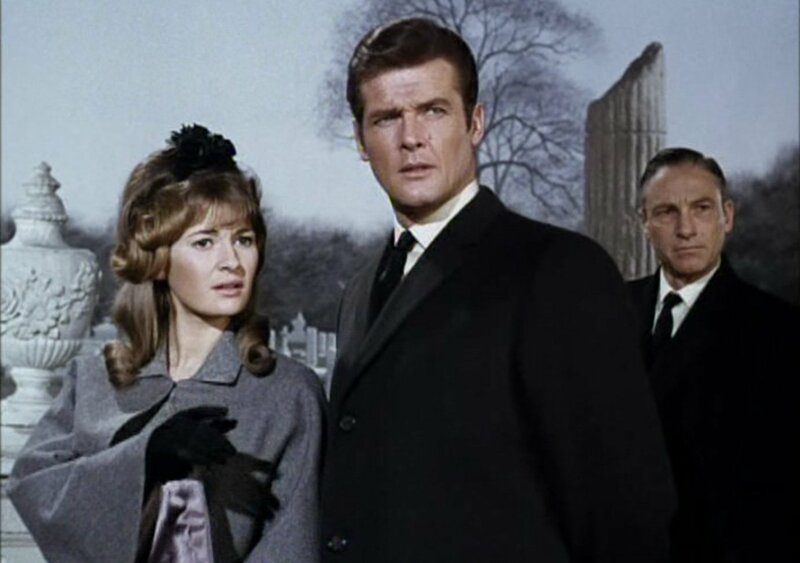 Roger Moore’s Simon Templar is well-dressed to a funeral in the Series 6 episode of The Saint, “Legacy for the Saint.” To keep warm in the cemetery he wears a charcoal grey car coat. The coat’s length is a few inches above the knee but is still considerably longer than a suit jacket so it can be worn over it. A car coat is shorter than the typical overcoat to make it easier when entering and exiting a car. Topcoats are often shorter as well, but they are also lighter and Moore’s coat is not. We don’t see much of the coat in “Legacy for the Saint,” but it makes another brief appearance in “The Time to Die.” The coat is cut with natural shoulders, buttons three, and has 3 buttons on the cuffs and a single vent. Under the coat Moore wears a three-piece suit made by Cyril Castle in charcoal with a very narrow-spaced light grey stripe. The suit coat has softly-padded shoulders, a draped chest and nipped waist typical of Castle’s tailoring, and like all of Moore’s single-breasted suits in The Saint this one buttons three. The suit coat is characteristic of the 1960’s Neo-Edwardian style, with narrow notched lapels, slanted flap pockets, double vents and single-button gauntlet cuffs. The length of the jacket is slightly shorter than the typical length, though not nearly as short as fashionable jackets today. The waistcoat buttons six with notch lapels and a straight bottom. And in his waistcoat pockets he wears a pocket watch with a fob chain. The trousers have a darted front with plain hems. Moore’s ecru Frank Foster shirt has a spread collar, plain front and cocktail cuffs, and this is the first episode we see Moore wearing cocktail cuffs. 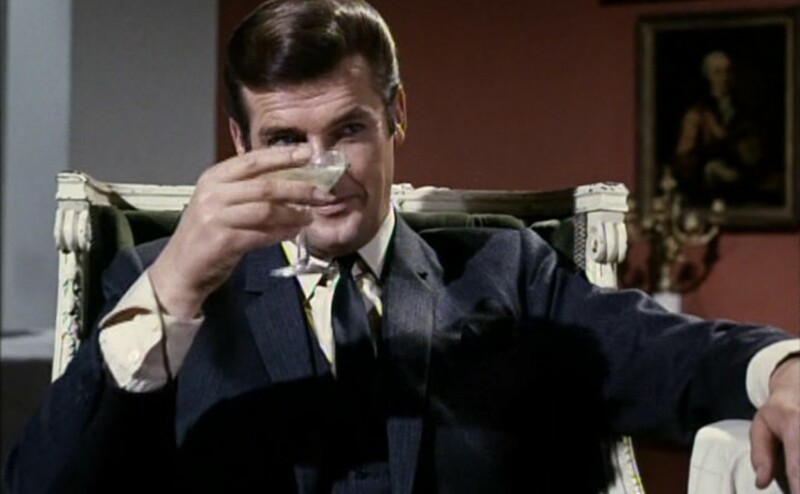 The turnback of the cocktail cuffs in The Saint has a much wider spread compared to the cuffs he wears later in the Bond films. They have some similarities to the Turnbull & Asser cuffs Sean Connery wore, but these lay flatter, as Foster prefers. Though Moore does not often wear black, the funeral setting of the episode makes this the time to include black into the outfit. Moore wears a narrow, black satin silk tie and a black silk pocket handkerchief folded with two points. A black suit for a funeral is not necessary, and for someone who isn’t an immediate family member of the deceased a black suit can come off as excessively somber. Templar wears the perfect amount of black for attending a friend’s wedding. And the shoes are black as well, of course. Good choice of post to match this dark, grey time of year, Matt. The examples of Cyril Castle’s tailoring showcased in this final “Saint” series are noteworthy and hard to better. Some of the double breasted suits and blazers with the narrow wrap which we see in “The Persuaders” and the first 2 Moore Bond movies, make their debut in this series albeit with narrower lapels. You’re right too about the all black thing (like Connery’s funeral ensemble in “Diamonds are Forever”) being too obvious. And of course, the more subtle choice chosen by Moore here illustrates why he was one of the most naturally elegant actors to have graced both the small and big screen. I like this. Would have preferred half an inch more to the lapels (to say nothing of a lapel hole) but this is pretty tasteful attire for this time period. I must admit that Roger’s suits from The Saint don’t do much for me. I recognize the fine tailoring that Roger wears so well and I do not dispute the praise above. But I think the suits are just a bit too much of their time and missing the more timeless factor of Connery’s of the same era. They also seem, like Pierce’s occasionally were, just a bit too affected, whereas, as Vesper says of a different James Bond, Connery wears his 1960’s fine tailoring with just a bit of disdain. On a non-sartorial note, has Roger’s hair ever been so dark? It gives him quite a different look. Moore’s hair does vary a bit in colour. It even seems to do so within some Bond films! But this is probably one of the darkest we’ve seen Moore’s hair, and it’s not a flattering as his more typical mid to light brown is to his skin tone and eyes. Looking at the first picture again, Roger looks a bit like Liberace. Not flattering compared to his mid-to-lighter brown, as Matt pointed out. I couldn’t agree with you more, Christian. This style is too affected for me, and, even if the cut is excellent, the narrow lapels and slightly tapered pants do make Moore look very strange, even a little grotesque, with an enormous torso (and the waistcoat only emphazises it) and skinny legs. There are also many affected details, which can look very nice “alone”, but when put together make him look too much like a dandy (turnback cuffs + jacket gauntlet cuffs + pocket watch…). I prefer McQueen’s Hayward suits in The Thomas Crown Affair, similar in cut , but I think McQueen succeeded in making them look timeless, even if -afterall, he’s a multimillionnaire businessman- they are luxurious, and not as sober as Connery’s for example, but still sober in a certain way. NB : on the other hand, this outfit is an excellent exception of the “no matching tie and pocket square” rule. The matching tie and pocket square works because they are both a neutral black. And only because it’s a funeral. I don’t think a black tie and pocket square is a good choice for any other occasion, except for with a white dinner jacket. I think I recall Pierce Brosnan wearing a black pocket square with a white dinner jacket in Remington Steele. There is absolutely no rule about not wearing a boutonniere with a pocket square, as your examples prove. If you wear both be sure they are different colours, unless both are white. Some people prefer not to wear both because it puts a lot of emphasis on one side of the jacket. Excellent point, Le Chiffre, about the cut of the suit not really flattering Moore’s build. After all, shouldn’t bespoke enhance one’s build, and not emphasize Moore’s disproportions? For example, I think Matt once pointed out that Connery’s suits were cut to work with his long torso, and Moore’s later, longer jackets provided balance to his relatively long legs. Seems like this suit is an example of a very-much-of-its-time cut that doesn’t really work for the actor. I really don’t really get this “affected” criticism. The gauntlet cuff is pretty discreet (you really have to look for it) and the cocktail cuff has never come up for this criticism before. In 99% of “Saint” episodes Moore didn’t sport a pocket watch in the waistcoat (I can only recall one other) and maybe this is what jars. But, if one goes this road (and I don’t see the point myself) couldn’t the current Golden Boy’s tab collars be viewed in this way too and even an American (and therefore definitely removed from a British character’s wardrobe) “affectation”? As for descriptions like “grotesque”, “enormous torso” or “skinny legs”, this is a little exaggerated and not apparent from the photographs and surely this charge could most definitely be leveled at Craig’s current choice of “tailoring”. Christian, the exaggeration was intentional, so that everybody could clearly understand where the problem was (because for me, it’s not very flattering). You don’t have to take my expressions to the first degree. Of course Moore hasn’t , in reality, a giant’s torso, etc. Besides, I have nothing against cocktail cuffs. They add some flair to an outfit. It’s the combination of numerous details and accessories -as I wrote it-, including these cuffs, that make the ensemble look affected, at least in my opinion. That said, I am not mad of the shrunken look at all, and I have never said that Craig’s current suits have a better cut (even if it’s not really bespoke) than this one. But it’s not because the Skyfall Tom Ford suits look and are awful that I should praise any other suit. I try to be neutral. Anyway, if I remenber all your comments, you often seem to appreciate Moore’s clothing style . Perhaps it’s because I don’t that we disagree. I hope that clears the point. Are you responding to me or David? Because I agree with your points and never picked up on the enormous torso exaggeration. I just think the cut is not flattering for Moore’s body. I am really sorry -Christian…-, I wanted to respond to David of course. My mistake. I’m with David here. Moore’s Saint fashions, while adhering to the conventions of the time (e.g. very narrow lapels), were far more form-flattering than Craig’s suits, which always look a size or two too small for him. Matt, any plans to cover the grey camel hair sport coat that Moore wore in numerous Saint episodes? It’s one of my favorites. I expected and welcome this discussion to continue, as the people perusing this blog all have very strong senses of personal, sartorial style. I don’t care for a look that is “affected”, or one that tries too hard. It is sort of like the United States Supreme Court Justice, Potter Stewart, who defined obscenity as, “I know it when I see it.” I often find Pierce Brosnan’s Remington Steele looks, and occasional 007 looks, as too put together, to perfectly matched. Above, I agree with Le Chiffre that all of the fine details, in isolation very stylish, add up to an overall fopish look that I just don’t care for. I know others on this blog have a different opinion and that’s fine. I prefer Bond to be well-dressed, but not self-consciously so. I don’t think Moore generally fell in to this trap as Bond, with perhaps a few exceptions (the scene where he is being measured for suits in Live and Let Die is cringe-inducing, with Bond at his most fopish and why is he getting measured for suits in the middle of an assignment?). Pierce sometimes does fall into the affected trap. I don’t recall the other actors looking affected. Connery and Lazenby wear their suits well, but look like they can role around in the mud and not care that they ruin fine clothing. I think that attitude balances the character’s would-be pretensions well. As for Craig, I do not have a problem with his current suits as they do reflect the current fashions and are not as extreme as I see around Beverly Hills. He would look anachronistic wearing a 1997 era Brioni, or a 1983 Hayward. As much as we want to call certain styles ,”timeless”, they really aren’t and are simply reflections of their times. But this has been hotly debated elsewhere here. His clothing certainly emphasizes his bulk, which apparently sells well, judging from Skyfall’s box office. But Craig at least appears fit, while Moore’s clothing occasionally emphasizes his very skinny legs that any action hero really should not have. As for the tab collar, it was ok in Skyfall. I could take it or leave it. A little fussy for Bond, but not a cardinal sin. I can respect and appreciate your points which are all very well, and convincingly, made. I guess it comes down to how you prefer your personal vision of 007 to look and obviously my leaning is towards Roger Moore’s style. I would still maintain that he was the best tailored actor to play the role (with Lazenby and Brosnan close runner’s up). Some people may view the character’s sartorial aspect as not important for their enjoyment of the movie at all (fair enough) but that’s the remit of this blog. While I can appreciate many items that Connery, for example, wore I don’t think he had any real feel for tailoring at all (and that’s not meant as a snobbish or elitist remark, but a fact) given his personal background. I, personally, don’t find anything particularly admirable about “wearing ones’ suit with disdain” and while Moore and Brosnan always looked like the best dressed man in the room whenever they appeared, I don’t think looking dapper in top drawer tailoring makes one a “fop” or “dandy”. I honesly can’t say that being fitted for a suit (as Moore’s Bond was when he arrived in New Orleans) is “foppish” or “affected” as this is how Bond likes/d to dress and he had just arrived from San Monique in casual wear, after all. In relation to this suit specifically, I wouldn’t care personally for the fashionable 1960’s narrow lapels – or the narrow tie – but surely anyone can see that overall Moore’s tailoring in this series was excellent. I feel, in conclusion, that there seems to be a consensus among many Bond fans that the style adopted by Daniel Craig and Sean Connery is the template and the only one that real, serious aficionados should take seriously and that the other actors who played the role should be airbrushed out of the picture. I don’t agree and find this simplistic. To admit that you admired Moore in the role in many circles is to invite sniggers or and attitude reminiscent of John McEnroe’s “you cannot be serious”! While I never cared at all, for example, for Dalton’s style (both in his portrayal and apparel) I can accept that he played a part in the films’ history and others admire what he brought to the role. It will come as no surprise that I agree with David. Bond’s elegance (at least as far as his cinematic incarnation goes) is part of the character – a bare-knuckled brawler with sophisticated tastes. I also fail to see the merit in wearing one’s suits with “disdain”. Bond didn’t start out as a wealthy man, and his sophisticated tastes are as self-taught as they are hard-won. The “disdain” comment reminds me of the worship of “sprezzatura” (crooked ties, unbuttoned buttons) that is so prevalent in some menswear blogs. I am Italian myself, but I fail to understand it. It strikes me as the worst form of vanity and hypocrisy – one buys and wears the best, while pretending not to care about one’s appearance. Without really wanting to enter the debate, isn’t the point about the way Bond wears clothes (which I think the ‘with disdain’ remark is illustrating), is that, in the books, Bond often appears fairly unconcerned about clothing. Simplicity and practicality seem to fit the character, hence his famous dislike for wearers of Windsor knots – too fussy, too indulgent. For what its worth, I think Moore’s suits are often the best things in his movies. I don’t like the Live and Let Die scene as I just think it unnecessary,nonsensical, and a bit pretentious. This leads into my next point – the “disdain” comment by Vesper. I certainly do not advocate looking sloppy. But I do not like pretensions, and I find Pierce occasionally pretentious, too “put together”. His suits call attention to himself rather than just looking elegant and low key, like Connery in 1962-1967, or Moore in 1973-74, and during the Hayward era. Even the 1977-1979 suits were excellent, and I can’t really recall Moore falling into the pretentious trap, remarkable considering the 1970s time frame for the first half of his tenure. I approve of dressing in top-drawer tailoring, obviously as we are on this blog. But I think it can look over the top if too many details are fussy. 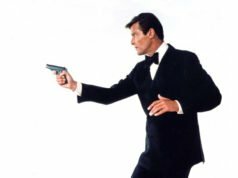 As for Roger Moore, he is the Bond I grew up with (the latter half of his tenure, from 1981 on) and I always defend his portrayal. I think he handles the few dramatic scenes he was given (in 1977, 1981, and 1983) better than any other Bond actor, outside of Daniel Craig. His 1977-1983 run was wonderfully entertaining. He lacks Sean Connery’s screen presence (most actors do), but he carries For Your Eyes Only in a way that only Connery in From Russia With Love carried another Bond film. And The Spy Who Loved Me is, I think, the best of the traditional, escapist Bond films (i.e., not From Russia With Love/OHMSS/Eyes Only/L2K/Craig era). The transgressions of his films are unrelated to his portrayal and much more related to the weak direction of Guy Hamilton, the often thin scripts of Tom Mankiewicz, and some bizarre in-references like the Tarzan yell and the Beach Boys showing up in the middle of action scenes. I agree virtually word-for-word with the last three paragraphs of your post. My only question regards your criticism of Pierce’s outfits – are you referring to his Bond persona or his Remington Steele persona? If the latter, I tend to agree with you – too many collar pins, pinkie rings, etc. Brosnan-Bond wore suits even in circumstances that didn’t call for a suit, but that might have been an intentional effort to hide his less-than-Bondian physique. Pierce’s Remington Steele suits, while often beautiful, are also often very fussy. I agree with you on that. His 007 suits are less so, but some of the ones I find a little too much: the Charcoal Windowpane from Goldeneye; the Goldeneye Prince of Wales Check; the Navy Cable Knit Jumper in Goldeneye; both of his dinner suits in Goldeneye and TND (though the latter is beautiful), and the Blue and Brown discussion on this blog previously. As has been observed elsewhere, Pierce often looks like the most expensively dressed man in the room, which does not necessarily equate to well-dressed. Sometimes, however, he nails it. 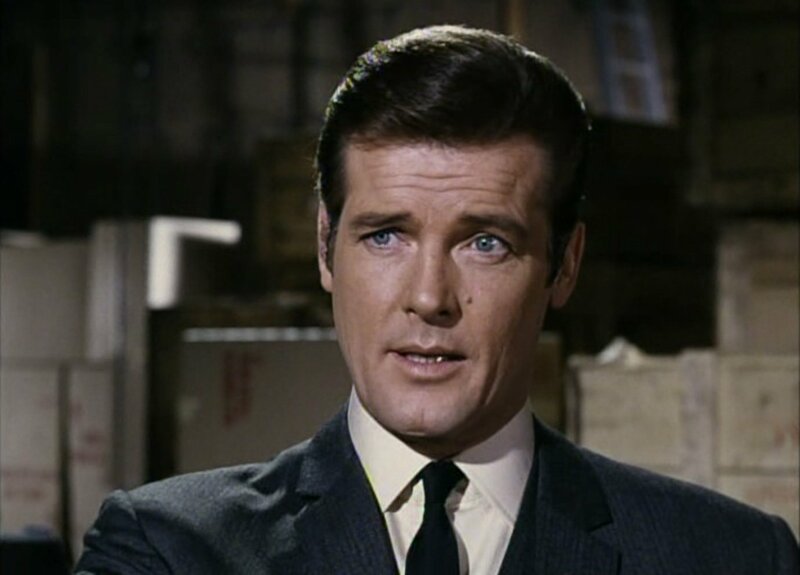 Christian, I agree with everything you said, except your feelings about Roger Moore, but since he isn’t the Bond I grew up with that’s a different matter. I think the “disdain attitude” mentionned above is something rather Bondian, but it’s not something pretentious. The sprezzatura Dan talked about is not the same thing at all, and I agree with Dan about this attitude being absolutely ridiculous -I am thinking of two Italians that do appear too regularly in The Sartorialist, for example- and not something Bond would do. That “disdain attitude”, in my opinion, is the fact that they (the different Bonds) wear the best, put their clothes on with application, and yet can be absolutely natural, not self-conscious at all ; they seem to have fogotten all about it. I mean, for them, having the best is something rather natural, cf. in Dr No : “My tailor- Savile Row.” : Sean said that line simply, even a little like if it was an evidence, but he doesn’t brag about it. I think that he means, for him, it’s normal to be dressed this way (cf. also Vesper saying : “Naturally you think human beings dress like that”), and end of the discussion : be dressed perfectly, yet simply, practicaly and soberly, like the Bond Fleming created. Something that every actor succeeded into, even if sometimes the era wasn’t helping (I am not mad of Moore’s clothing choices in the beginning of the 70s, although I must say the Hayward era is superb and suits him perfectly) and even if they were some things that could be criticized, for every actor (except Lazenby, because he made only one movie that was sartorially (and for other aspects too…) perfect, and Dalton, well, I think everybody on the blog will admit that his wardrobe was terrible). I find myself on both sides of the fence in this discussion. While this suit isn’t as unflattering as some of the other Saint suits that Matt has featured previously (I’ll admit that I haven’t seen an episode of the Saint in many years, and the suits may look better in motion), they still don’t work – for me – as well as they should. I do find this to be puzzling, since the Cyril Castle outfits from the Persuaders don’t seem to have this problem, and the suits from LALD and TMWTGG are some of my absolute favorites from the series. 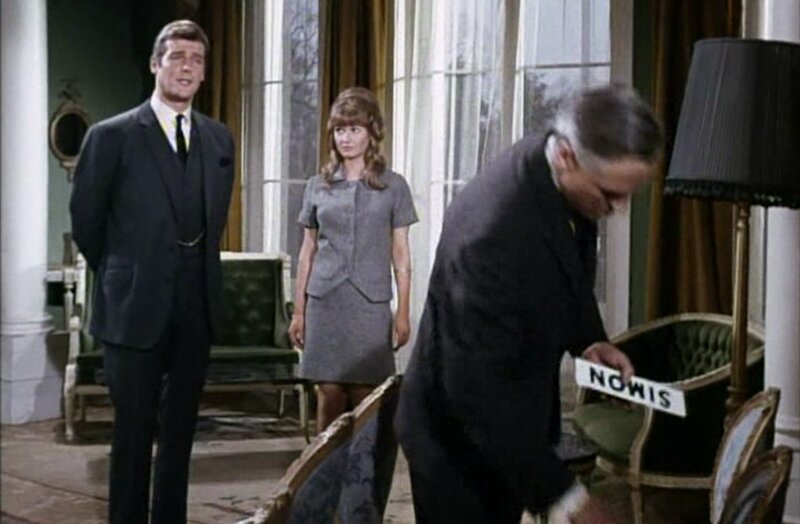 As for the scene in LALD where Bond is being fitted for a suit, I always have assumed that that was a callback to the passage in the book – which Matt has quoted in the Literary Bond section – where Bond is fitted for a couple of suits and other items when he is being “Americanized”. 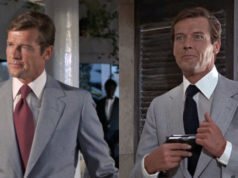 I also want to say that I really enjoy this blog, and I have been inspired to find the complete series of the Persuaders on dvd (now all I have to do is find time to watch them). Actually I really liked the Goldeneye Prince of Wales Check and the Navy Cable Knit Jumper in Goldeneye, even though the ascot (cravat?) Pierce wears with the jumper is a throwback to a more elegant past. The only outfit I found slightly objectionable in Goldeneye was the unbuttoned DB blazer with the funky open-collar blue shirt. This car coat (or one almost identical to it) also re-surfaced in two episodes of The Persuaders; “Someone Waiting” and “The Time and The Place”.